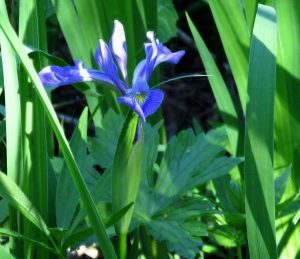 I almost missed this Blue Flag Iris (Iris versicolor) as it smiled at me amongst the leaves of the Queen of the Prairie (Filipendula rubra). I’m always finding surprises in my prairie. The latest is a Blue Flag Iris (Iris versicolor). I planted them in the late 1980s when I was first developing my prairie, but over time and the droughty weather we’ve had, they seemed to have disappeared. Imagine my surprise when I was walking in the wet mesic end of my prairie yesterday “to see what I could see,” and there smiling back at me was this lovely Blue Flag Iris! What a delightful surprise!! The Blue Flag Iris has always been one of my favorite wetland plants, and I’m happy to say they grow in the standing water in between the ledge rock in the front yard of our hunting shack. We often see Easter Tiger Swallowtails (Papilio glaucus) hovering around them seeking nectar. I love a bright yellow color, but although beautiful to the eye, this Yellow Flag Iris (Iris pseudacorus) is not native to North America. It’s native to Eurasia and easily displaces non-native plants. My delight, however, was short-lived. Not far away was a non-native Yellow Flag Iris (Iris pseudacorus) smugly sneering back at me! 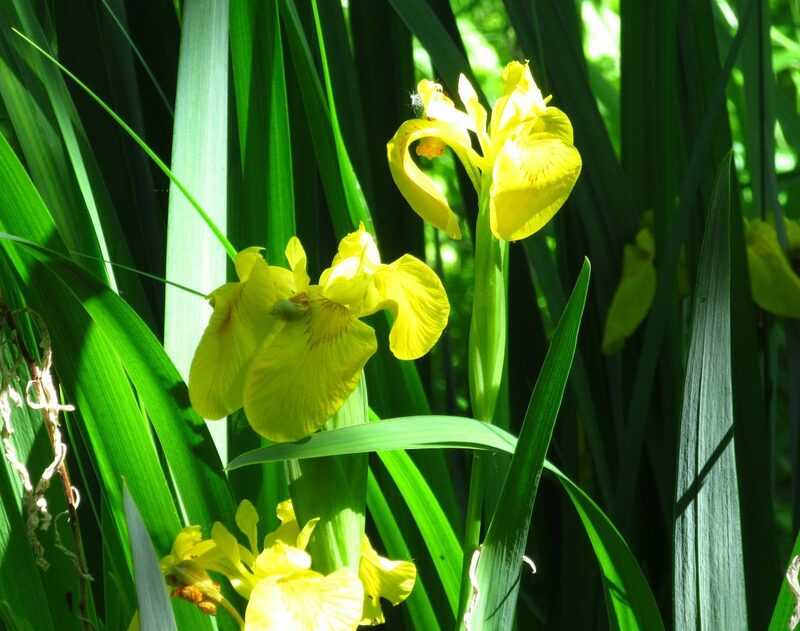 Unfortunately, while Blue Flag Iris prefers wetlands, marshes and ditches, Yellow Flag Iris is not quite so particular and can survive quite nicely in upland areas as well. Looks like I have my work cut out for me; I found another clump about 20 feet away. Digging it out is probably the easiest method of eradication, since the Yellow Flag Iris propagates by rhizomatous roots just as the Blue Flag Iris does. But just like the Blue Flag, its sap and tissues are poisonous and can irritate sensitive skin so good glove protection will be essential. Wish me luck!